On Russian seamanship | The British in Crete, 1896 to 1913. 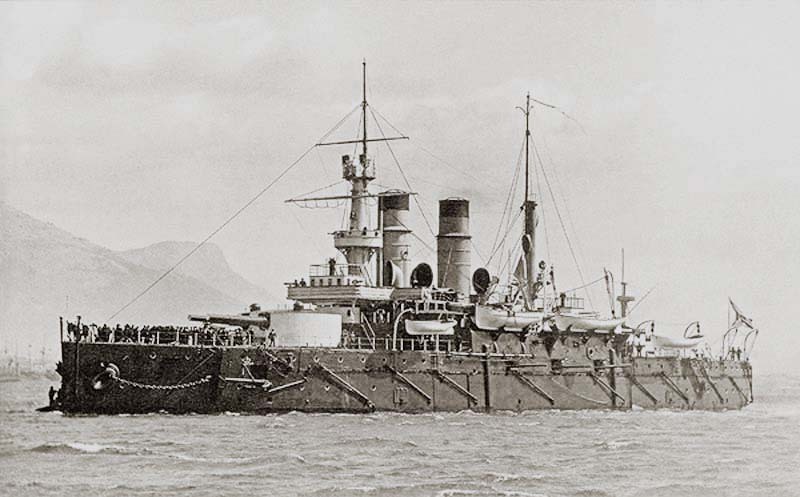 One of the initial contributions by Russia to the International naval fleet sent to Crete in 1897 was the Pre-Dreadnaught battleship ‘Sissoi Veliky’. The ship had been a floating disaster since the very beginning, suffering from numerous design, engineering and construction faults. Matters came to an unfortunate head on 15th March 1897 when on a routine target practice, the rear turret of the battleship exploded, killing 16 men instantly, another six dying later of their injuries. The reason for the explosion was later put down to the crew disabling a faulty safety mechanism, and the incompetence of the turret commander. Explosion on Sissoi Veliky. The Graphic 27 March 1897. Memorial for Russian seamen from Sissoi Veliky. 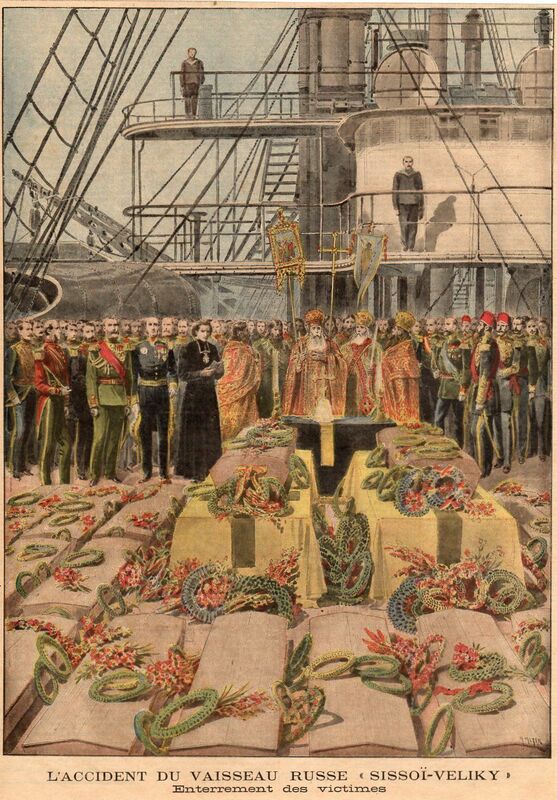 Burial of Russian seamen from Sissoi Veliky. 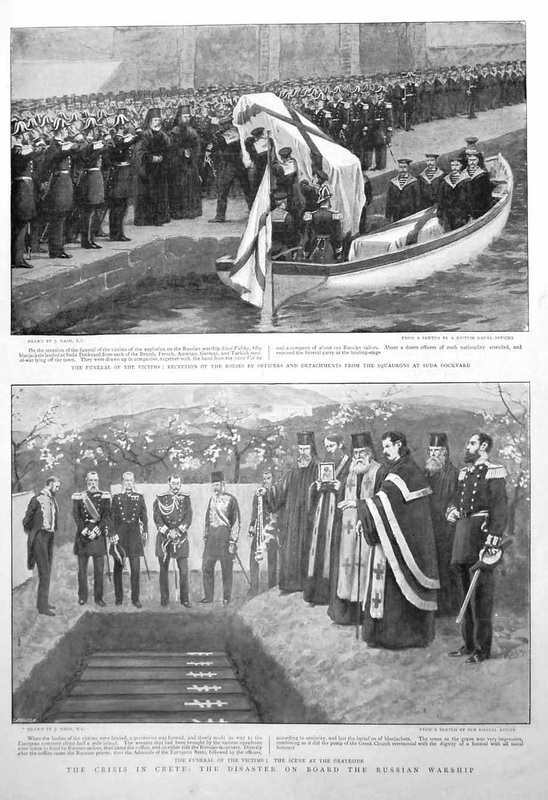 The Graphic 3 April 1897. Seven years later, according to Second Lieutenant W. D. Downes, 2/Royal Sussex Regiment, who served on Crete with his battalion in 1906, matters did not appear to have improved that much. “On the day I arrived at Canea, the Russian Cruiser left Suda Bay in order to take Prince George of Greece back to Athens. On her way out she ran down the Italian Cruiser and almost sunk her. As the harbour is said to be large enough to hold an entire British Fleet; such a thing has never happened before in the history of Naval navigation. The Russian torpedo destroyer then came to tow the cruiser into shallow water. 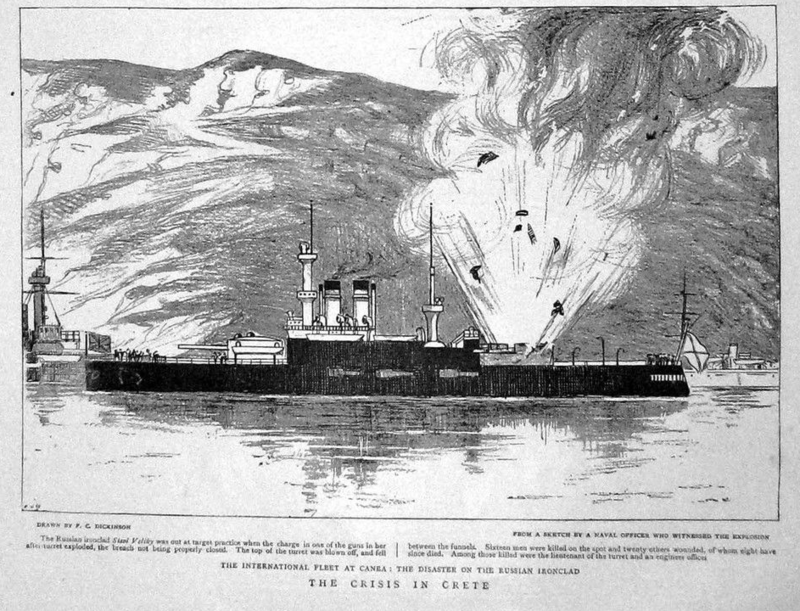 The Captain of the destroyer wished to take her, to the only part of the harbour where there were rocks; the truth of the matter was that all of the officers of both Russian Destroyer and Cruiser were drunk; so bad were they on the destroyer, that the Italians sent one of their own Officers to take charge of the Russian Destroyers, and thus get their Cruiser into shallow water before she sank. An Italian Naval Officer told me that the only safe time for a Russian ship to leave harbour is early in the morning; 11a.m. is too late according to him, for they are seldom sober after 10a.m. This entry was posted in European Intervention Crete, Naval, Uncategorized and tagged Crete 1897, Russian warships Crete, Sissoi Veliky 1897 on August 29, 2015 by Mick McT. Pingback: God’s revenge | The British in Crete, 1896 to 1913.